Lexus has just taken the wraps off the all-new 2018 LS 500 at the 2017 Detroit Auto Show. This new model is lower, longer and wider than the previous LS and features a strikingly bold design with a coupe-like silhouette. The LS is based on the same GA-L architecture as the LC coupe, which should give it a sporty feel. Engine options on the other hand are very different. The LC 500 is powered by the same V8 engine from the RC F and GS F, but the new LS 500 will only have a 3.5-liter V6. The V6 is a twin-turbo unit that will be mated to a 10-speed automatic transmission. Output is 415 hp and 442 lb-ft of torque, which are both big improvements over the current model. Lexus projects a 0-60 mph time of around 4.5 seconds in RWD models. All-wheel drive will also be available. Even though the 10-speed transmission is a torque-converter, Lexus says that shift times rival that of dual-clutch transmissions. The drivetrain will be customizable with several drive modes including normal, sport, and sport + which affect throttle responsiveness. Like most Lexus models we expect that this powertrain will be incredibly comfortable while also giving a sporty exhaust note when put into sport mode. Lexus says that the 10-speed transmission is ideal for a wide band of power in many driving situations. The high torque of the twin-turbo V6 matches well with the higher gears for effortless highway cruising, while quick downshifts allow for direct acceleration. The torque-converter can also lock up to provide a direct feel and better fuel economy. 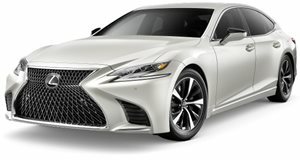 Lexus goal for this new LS is for it to embody "the history and image of Lexus and serve as a symbol for everything the brand stands for.” The LS follows the new Lexus design language that we have come to know. The new LS ditches the classic three-box look in favor of a coupe-like design that will (hopefully) appeal to younger buyers. Of course this new car has a very large version of the company's spindle grille, with new unique "Z-shaped" headlights. The LS will have five wheel designs, including two new 19-inch and 20-inch designs. On the inside it is clear that this is a flagship model. There are new seating designs which feature available 28-way power front seats with heating, cooling and massage functions.The rear seats can also have these features as well as a raised ottoman, available as part of the rear-seat luxury package. The rear seats can even be raised to help occupants exit the car. The navigation system has a 12.3-inch display with an optional 24-inch heads-up display (HUD), which Lexus says is the largest in any car. The system is controlled through a new remote touch system that is supposed to mimic the functionality of a smartphone. The LS features an available Mark Levinson 3D audio system which lines the ceiling with speakers. We tested a Mark Levinson system in our review of the RX 450h and the sound was fantastic. The Lexus LS is back in a big way and ready to compete with the best that Germany has to offer. The LS 500 will be available near the end of 2017 and should be more affordable relative to its German rivals.